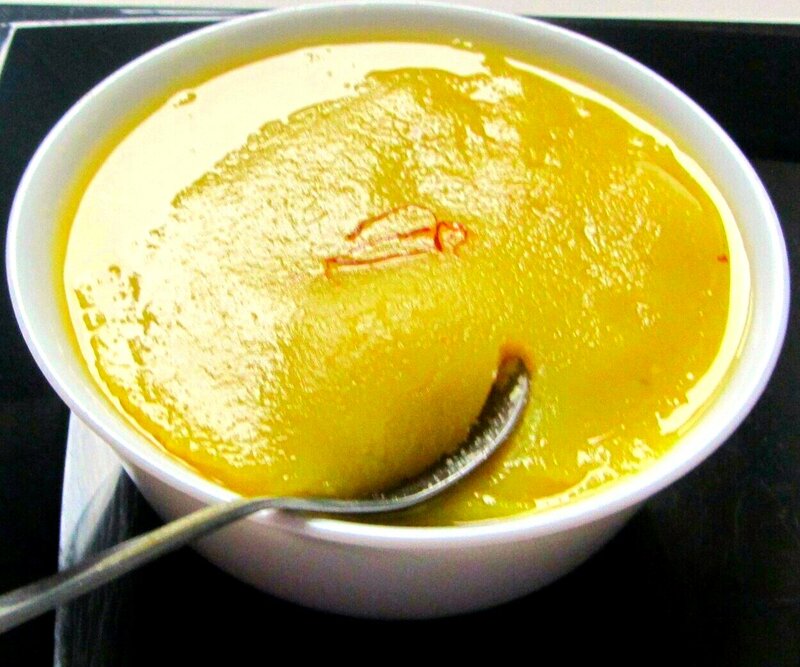 Badam Halwa: Badam Halwa (Almond Pudding) is a regal dessert fit for Kings! While the recipe does not call for too many ingredients, nor is the process a complex one, but it takes time to make a good badam halwa. Almonds (Badam) are extensively used in Indian cooking even though they are little expensive. You literally need to stand over the pot and stir constantly to prevent the badam halwa from scorching or burning. Grease a plate with a teaspoon of ghee. Soak the almonds for 3-4 hours in enough water. Peel the skin off the almonds. Grind the almonds with 1/4 cup milk, to a really smooth paste. Take a deep heavy bottom pan non stick pan (preferably deep pan to avoid splattering). Add sugar and 1/2 cup water in the pan, on medium heat. Bring the sugar mixture to boil until the sugar dissolves, on medium heat. Add in the condensed milk, saffron food colour and green cardamom powder. Keep stirring for about 4 minutes. Add a teaspoon of ghee in regular intervals and keep stirring until the halwa starts leaving the pan. After about 3-5 minutes, you will see whitish bubbles start appearing at the bottom of the pan, where you stir. The badam halwa has reached the right consistency. Pour the badam halwa in a greased plate. Serve in a bowl, garnished with saffron strands. While grinding the almonds, after the few seconds of grinding, make sure you wipe off the sides and lids of the mixer to ensure even grinding. Adding condensed milk is purely optional. It enhances the taste. If your halwa is sticky, then you need to add more ghee and keep stirring for a while again. The consistency will be perfect if you do the whole process in medium flame. After cooling down completely, the texture gets thickened a bit. So be patient till it cools down. If you find it still sticky, then you can always stir again in the pan and add more ghee to get the right consistency. If you have any queries regarding the Badam Halwa recipe, please leave a comment.